Dean Hussey displays the certificate and flowers received as part of The Merc Playhouse’s Steinbach Award for Outstanding Contribution to Live Theater. 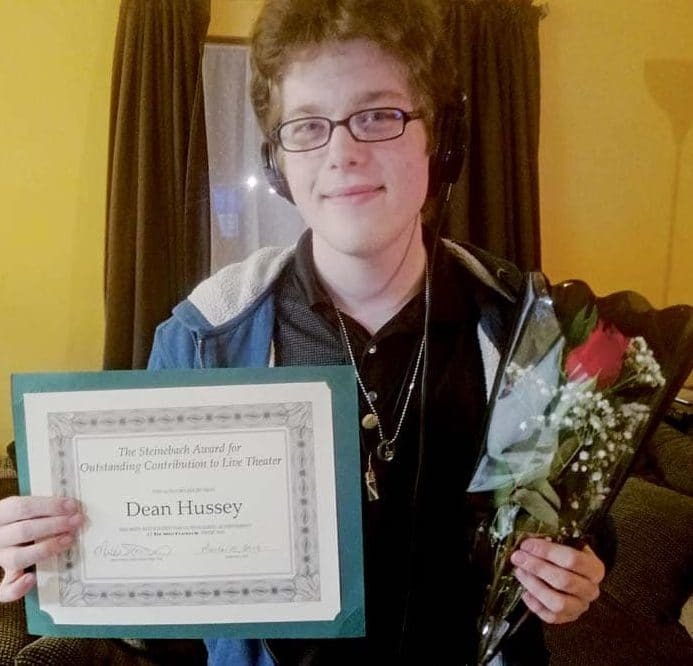 Liberty Bell High School senior Dean Hussey is the winner of The Merc Playhouse’s 2019 Steinebach Award for Outstanding Contribution to Live Theater. In a press release, Merc Executive Director Missi Smith said Hussey began his association with the theater during its 2014 production of “Willy Wonka, Junior,” working in the sound booth. The award is named after The Merc’s founders, Carolanne and the late Egon Steinebach. Dean Hussey’s mother, Darla Hussey, was the winner of the inaugural award in 2018. She has been involved in several Merc productions, creating costumes, props and special makeup including elaborate face-painting. 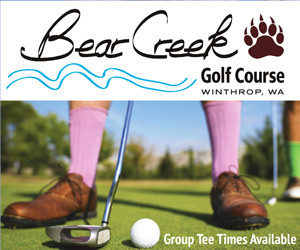 Darla Hussey is the graphic designer and social media director for the Methow Valley News. “Adding another whole level of risk, and stepping even further out of his normal comfort zone, he became a strong advocate for those living with autism while teaching his fellow cast members about his own experiences with it,” Smith said. Hussey will graduate in June and is exploring college options. 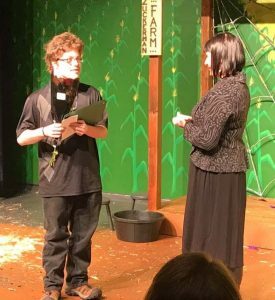 He has been accepted to Shoreline Community College’s Music Technology department as well as Central Washington University’s Theater Arts Design and Production BFA program. Hear Dean Hussey’s songs composed for ‘Bike America’ at https://soundcloud.com/razorr3kker/the-road-home and at https://youtu.be/hj59Qa0UPoA. You can check out the full range of his work on Soundcloud or YouTube, as well.